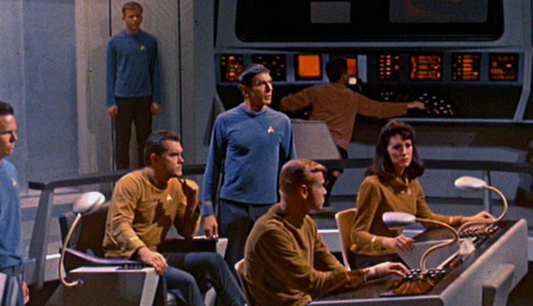 TOS Season 1: Episode 1 - "Pilot: The Cage"
Captain Christopher Pike is running the Enterprise. Spock shows emotion. They've got an old man bartender man for a doctor. I was surprised to see a strong woman role in the Number One chair. While the actress didn't get to keep her role ('cause that was apparently just a biiit too progressive), she ends up being "the First Lady of Star Trek" going on to be the ship computer voice we all know and love, as well as Troi's annoying Mom on TNG among other roles. Captain Pike is kind of a hardened captain that isn't sure he wants to be captain anymore. He's been in the position for a while and he's weary of it. Deciding who lives and dies, yadda yadda. Very different from the brash Kirk we know of later on. This is neat to me actually because despite this episode being a failed pilot, it is Star Trek canon that Pike was indeed the captain before Kirk on the Enterprise. You could consider this episode (other than Spock) to be a legit prequel. Turns out, the Pilot is simultaneously more sexist and less sexist than I was expecting. Right off the bat we get a strong female Lieutenant on the bridge as I mentioned before. I was impressed. Star Trek has always claimed to be progressive in these things, despite every series needing a token ship mate wearing an overly sexualized uniform (Uhura, Troi, Seven of Nine, T'Pol....). It took me off guard when the ship's yeoman was wearing a turtleneck and business slacks. There was a mini-skirt in the first few minutes, but it was standard 60's civilian clothing worn by random people walking around on deck. The dude was wearing short shorts too, so fair game. Then Pike goes and ruins the whole progressive vibe and get's super flummoxed when the pretty yeoman shows up. He says something to the effect of "I'm just not used to seeing women on the bridge." First Officer smthingorrather... (I don't think she gets a name. If she does, I missed it. ) ... looks pretty offended and Pike says "Well, you don't count." So I guess your mileage varies. Side note: Turns out I know nothing of naval positions or the term "yeoman". I always though Yeoman was Yeoman Rand's first name in TOS. Anyway, the crew gets a distress call to investigate in the Talos System or something or rather. Standard Star Trek stuff. We get a randomly long ward speed scene in which stars are super imposed over the bridge crew milling about. Some ensign holds up the number 7 with his fingers to Pike randomly out of nowhere... cause they are going Warp 7 I guess? Next thing we know an away team is heading down to a terrible 60's backlot stage with some rocks and a matte painting. I shouldn't be so critical, I mean it was the 60's and a pilot episode and set design wasn't great back then, but my HD trained eyes are super annoyed by seeing multiple shadows for each person due to the studio lights and their shadows ON the matte background. I'll just have to live with it. So the crew is on the planet and they are all wearing weird blue overcoats which I guess is the away team uniforms? 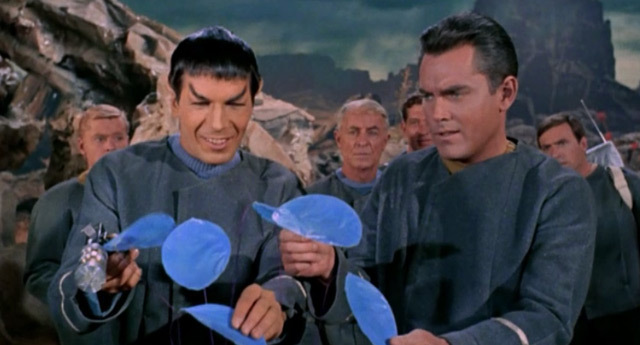 Spock is smiling and acting very un-Spock like and the crew is just wandering aimlessly touching all the local plant life. Seems like a poor strategy for landing on an alien planet. Awwww... look how happy Spock is! Who's a good Spock? You are! Yes, you are! So they find this crashed colony which is being watched by some big brained aliens. There's a random young blond blue-eyed pursuit which Pike can't keep his eyes off of. I guess he's not so different from Kirk after all. She leads Pike away from the rest of the group because Captain has to get him some tail, am I right fellas?. Turns out she leads him into a trap and the brainy aliens kidnap Pike. Then we get like a minute and half of people shooting phasers at a rock to no avail. Time well spent. Seems the brain guys just want to experiment on Captain Pike along with people in dollar store Sasquatch costumes. 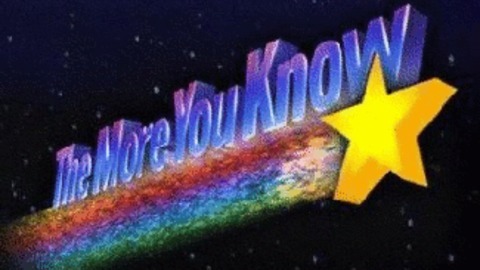 The distress signal wasn't real and neither were the people. This confuses me. If the big brained aliens just wanted to learn about humans, how did they know so much to create realistic projections of human colonists to begin with? Sure the girl was off, but the rest of the colony seemed pretty normal. Oh well. Plot forward! Brain guys put Pike through various tests and experiments. Fight scenes, sexual tensions, they even subject him to literal hell fire as a "story he once heard as a child." The Enterprise crew tries several methods of saving Pike without success. As a computer guy I found the moment the aliens take over the ships computer and the Ensign says they are reading all the ship's data "even the tapes!" highly amusing. It gets kind of existential and goes into conversations about what life would be like if your dreams could become reality. You'd leave behind any knowledge of how to actually live life or function as a society. Moments like these are what makes Trek great though. I'm glad to see even the pilot got that right. The blond girl from earlier keeps showing up in his visions as the girl of his dreams and a guide of sorts. She even becomes the infamous green slave girl for a bit! Then the 60's Mad Men era takes over again and it descends into all the women in the show being breeding options for Pike. You know, like Adam and Eve except Adam gets to decide between the pretty slave, the brainy Number One, or the sexually charged yeoman.... so.... back to that. You were doing so well, Star Trek, then you dropped the ball at the 5 yard line. Ah well. Pike threatens the brain guys and tries to escape... then the brain men find out that humans are too volatile and hating of captivity to be useful from reading all of human history so they let him go.Turns out the beautiful girl is all lumpy and misshapen. The brain people give her the illusion she's young and pretty. Once they release Pike, she gets a brain image of Pike to live with forever. Everyone lives happily ever after, I guess? Despite the campy old nature of the episode, it's actually a pretty strong story. I liked Pike. Kind of sad we didn't get to see more of him. I don't like that this is one of those stories though that heroes don't really accomplish anything. It just resolves itself on its own. Same thing would have happened eventually if Pike had sat grumpily in his cage for a few days ignoring them. All in all, I'll miss the dirty old doctor the most. Though I suppose Bones is good too.